John had not had the chance to play this yet, so as there were five of us and those that had played before were keen to give it another go, we set out on the epic voyage. This time, Mark K and Nige were very wary of getting wounded as this had been their downfall last time. Nige got off to a good start but Mark K had luck against him on a couple of early risks. I managed to grab the special card that allows you to decline any wound and I held onto this to protect against the deadly double wound at the end. As we approached the end of the game, Nige had amassed a fair number of fame points but was left unable to compete much in the critical last few episodes. Mark K recovered from his early misfortunes and scored steadily, especially in the treasure episodes. However, this left me with most treasure and most symbols at the end to collect a vital 12 fame points. The final count revealed Mark K and me tied with 25 points, a joint win made all the more satisfying by NIge lagging behind by just one point. John’s rating was equally high as we had decided last time and I’m still finding there plenty to enjoy in the game. Good stuff. We finished off with this nice light memory cardgame, designed by Reinhard Staupe and published by Amigo. There are two types of card: number cards and island cards. Everyone starts with 1 island card and a hand of 3 number cards. Each turn, a player plays a number card, announces the current total of that card added to the last player’s total, and draws a replacement number card. If the total goes above 30, subsequent cards are deducted from the total until it falls below 10, at which point cards are added again. The player to the right of the one whose declared total breaches the 30 or 10 limit gets rewarded with an extra island card. 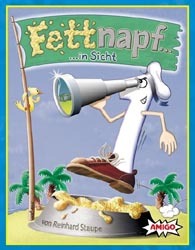 If the declared total ever matches the number of an island card held by another player, the declaring player gets a penalty Fettnapf card. Once one player has gathered 4 Fettnapf cards, whoever has the fewest number of penalties wins. This is a very simple game but there are some tense moments when you’ve forgotten which island cards have already been declared. Mark G had everyone in stitches when, after I had just picked up a Fettnapf card, he immediately played a Zero card, declared the same total and after the briefest pause said “Ah, I don’t think I meant to do that.” We weren’t surprised after that when he became the first to collect a 4th penalty. We were surprised that Nige was demonstrating the mental capacity (some might say, luck) not to pick up a single penalty and claim the win. Nice quick game which we all pretty much enjoyed. 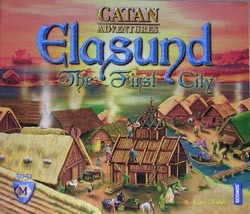 After Cash Trap, we turned to the newest Klaus Teber game in the Catan Adventures series: Elasund. 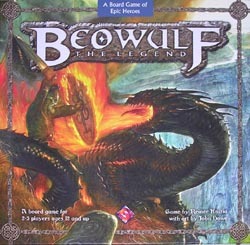 This game is about the growth of the first city of Catan and borrows certain of the characteristics from standard Settlers of Catan but does not have the resource trading aspect and is a bit more cut-throat in the way players are competing for victory points. Our game started reasonably friendly. I challenged Nige for space to build a four square building on rows 11 and 12 and he decided not to turn it into a war, so I got my building reasonably easily. This was good for me as 11 was rolled on the dice much more than statistically justified. Nige then concentrated on getting the first church piece in place, which he achieved, but then I turned to adding church pieces. These are useful as the VPs gained from church building canâ€™t be lost. Mark G was the wall king, building most of the cheap wall pieces. He also knocked over one of my early 2 space buildings, before competing with Nige for space on the far east of the board. My gold production was flowing quite nicely during the middle of the game and I could have continued with church building. However, I spotted an opportunity to set myself up for a 6 square building that would also cover 3 windmills and catapult me to 10 VPs and the win. I managed to get my building permits in place before Nige spotted what I was doing. It then became a race between the two of us to get the few gold needed to build. Then, the gold dried up for both of us for two complete rounds! Amazing. Luckily though, the gold returned and I was just able to get in ahead of Nige to place my winning building. Elasund is a really good game. Our first try got really tense at the end. There are plenty of routes to get VPs and some of these can mess with other players so there is a fair bit of to-ing and fro-ing. Our game took about 90 minutes but this could come down with more plays. Should also play well with four.